In the past, people made the mistake of only focusing on base miles. Then they’d find themselves struggling throughout the season, for they’d trained their body only to go slow. So you want to take the other 15% – 20% of your time to begin training a little speed, power, and coordination. 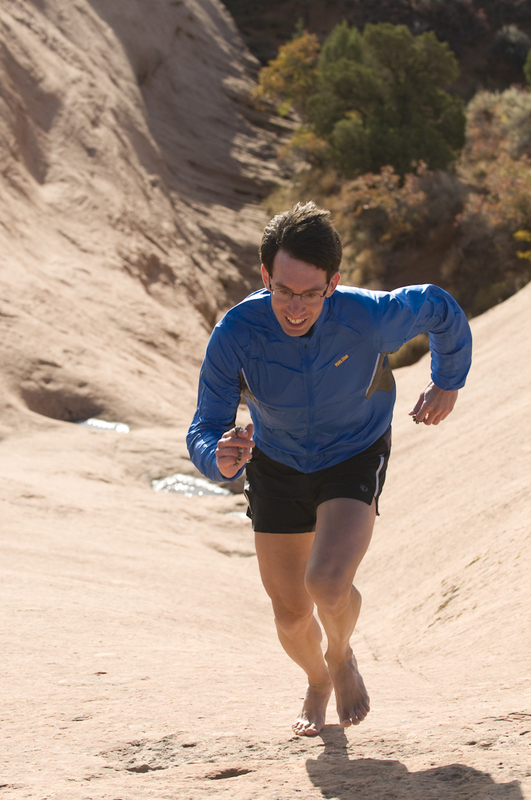 Here I am charging up a steep slick rock hill in Moab, Utah. I try to train barefoot every chance I get. Supplement your base miles with short efforts up hills, a key secret to African running dominance. Short hill efforts early season dramatically strengthen the legs and your joints. Stay tall, don’t bend forward at the waist, and keep your head pulled to the sky. If you can, do these off-road, so you have the added benefit of having to balance on uneven surfaces. Add to this the occasional fartlek. A fartlek is a quick burst of speed, or a pick-up of the pace you do without a watch–really just for the fun of it. As you’re slowly running along, you may suddenly find yourself sprinting for that hill and flying down to the river…done without the goal of repeat efforts, or your exact speed, or a certain amount of “recovery time” before you go again. These are a perfect complement for getting speed back in the legs, without tiring them out. It’s really running like a kid again, because you’re only doing it when you feel like it, rather than when you have to. Fartlek training can really be kid time, sprinting for a distant tree, picking it up to make a traffic light or just for the heck of it! During this time you should also be doing specific running drills at your park, gym or on the infield of your local track. I like doing these before the run, so we can learn good habits for our runs. In essence, these are weight-training and plyometric exercises to get the muscles to strengthen up, get springy, and work on lateral stability. If you’ve been in the gym, you want to continue that for now. If not, 4-6 weeks in the gym to work on one-legged exercises is a great way to complement your mindful base miles. Do your strength work one leg at a time to work on symmetry, balanced strength, speed and injury prevention. Of course, you want to stretch after your strength work as well. Last, take at least 5% of your training time to work on your core. Of course, you should mindfully focus on running with your core engaged in all of your base miles. On top of that, I can’t recommend enough finding a great Pilates class. Pilates teaches you how to keep your core perfectly engaged when you run. No Pilates class around? Then grab a medicine ball and mindfully (working on form and posture) work on side-to-side movement, throws, and catches, even working on going on one leg, or using a balance ball beneath you as well. Now is the perfect time of the year to build your running foundation strong for the season ahead. Focus on your mindful base miles, enjoy the effortless running. Don’t worry about speed or distance, just put some kind and gentle time on the legs. Then add in a bit of hills, speed, and of course, drill and gym work, for your best season ahead!